Last time, we focused on the Silver Age/Earth-1 DC Universe timeline. This time, we’ll look at the post-Crisis DCU’s timeline. Overall, while Earth-1’s compressed timeline had some issues (particularly with Donna Troy and Wonder Woman), they pale in comparison to the issues with post-Crisis. After 1985-86’s “Crisis on Infinite Earths,” DC opted to reboot the origins of Superman and Wonder Woman. While successful reboots (even if I liked the Bronze Age Supes), they also seemed to signal the start of a spate of reboots. It also gave us a lot of historically-revisionist, “everything you know is wrong” retcons that’ve plagued DC to this day. They’ve also been the source of a lot of DC’s continuity problems. Of course, there’ve been reboots and retcons before. However, the assumption until the Superman/Wonder Woman reboots was that nearly any comic published about the characters “happened” in a fictional context. That was the case, even if it was deemed to have “really” been their Earth-2 counterparts. Since “Crisis,” however, the idea of throwing out years or decades of a character’s stories entirely (even within a fictional context) really took off. 1994’s “Zero Hour” and various stories afterwards tried to retcon/fix some of the worst of the post-Crisis timeline’s elements. The first superheroes appeared in the late 1930s, no longer including Superman, per the retconning away of the Golden Age Kal-L. The Justice Society was formed in 1940, and dissolved in 1951 (similar to the Earth-2 timeline). (Perpetually) 12 years ago, Superman debuted, starting the modern heroic age. Batman, Wonder Woman, the Titans, etc. soon debuted afterwards. Some of the JLA-JSA crossovers still happened, as long as they didn’t involve parallel Earths. “Crisis on Infinite Earths” happened as some time-related “crisis” to a single universe. Yep, “Crisis” somehow retconned itself. The multitude of crossovers since also happened (“Zero Hour,” “Infinite Crisis,” etc.). Superman and Batman are about 35 years old. Keeping with the previous posts, I’ll list the pros and cons of the post-Crisis timeline. Donna Troy’s origin is revamped to divorce her toddlerhood from Wonder Woman’s involvement. This avoided the Earth-1 timeline’s issues with Wonder Woman/Girl. The post-Crisis timeline is still reasonably long. “Zero Hour” declared it’s been 10 years since the start of the modern heroic age. Various Secret Files & Origins stories afterwards lengthened the timeline to 12 years. Hawkman’s the poster child of the worst example of how damaging ill-conceived retcons/careless continuity approaches can be to a character. This comic explains it all. Moreso than anything else on this list, Hawkman’s easily #1. The historical-revisionist retcons that happened heavily and on editors’ or writers’ whims, leading to confusion and even further retcons (to explain the previous ones). Some of these seemed chosen without thinking through the long-term results. For example, in the 90s, the Batman editors decided to push the idea that Batman has “always” been an urban legend unknown to the public at large. Never mind the idea flew in the face of decades’ worth of stories. Since Batman wasn’t rebooted after Crisis, a lot of his pre-Crisis stories still “happened.” Pre- or post-Crisis, Batman definitely was seen in public plenty of times. But it didn’t matter to the powers that be. As such, “Young Justice” was forced to write around this since it used Robin (Tim Drake). Eventually, DC thought better and disposed of this silly idea. Removing Superboy from Superman’s past screwed with the Legion’s backstory big-time, leading to various patches (the “pocket universe,” Mon-El’s backstory retconned, etc.). There was also other editorially mandated mucking. The Legion was finally rebooted after “Zero Hour”, and a few more times after that. “JLA: Year One” #2 (February 1998). Art by Barry Kitson. Donna’s origin was changed from what it was pre-Crisis. Post-Crisis, she was now saved from a fire/raised as a young child by the “Titans of Myth.” However, DC for some reason decided to have Wonder Woman debut after “Crisis” in the post-Crisis timeline, i.e. years after Superman, Batman, and the Titans debuted. Not only did this reduce Wonder Woman’s career length, but it also had the oddity of Wonder Girl (Donna Troy) with a longer career than Wonder Woman. It also forced DC to retcon the Silver Age JLA stories by claiming it was “really” Black Canary who was in all those stories, not Wonder Woman. (Never mind the vast difference in power levels between the two women, or implying the two are interchangeable.) The now-nonexistent Golden Age Wonder Woman was similarly replaced in JSA stories by various minor Golden Age heroines. Sometime in the late 90s or 2000s, DC realized the oddness of all this, and fixed things. First, Wonder Woman’s mother Hippolyta became the Golden Age Wondy via a time-travel storyline. Second, DC declared Diana did debut alongside Clark and Bruce, allowing her Silver Age JLA appearances to happen as-is. Donna Troy was also “fixed,” albeit confusingly. See this comic strip explaining Donna. 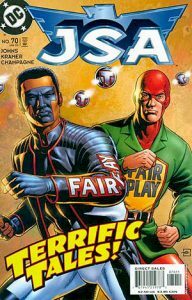 “JSA” #7 (April 2005). Art by Dave Gibbons. While the Golden Age characters were still tied to World War II and thus aged in real time (up until the “12 years ago” start of the modern age), their JLA cohorts were still on the sliding timeline (a la Earth-1’s). The same applied to the JSAers’ kids (of Infinity, Inc.), who were aging in real-time pre-Crisis, but now were perpetual twenty- or thirtysomethings. “The Simpsons” has this same situation with Grandpa (who’s tied to World War II as a vet) and his son Homer (who’s perpetually in his late 30s). Granted, TV sitcoms’ looser continuity concerns aside, Grandpa’s joke is that he is old. Still, unlike the JSA members’s spouses, Grandpa’s wife/Homer’s mother is much younger than Abe. Given the increasing timegap between the 1940s and “12 years ago,” this became more and more noticeable as real-world time went on. That’s in spite of some handwaving in stories: age reversing spells, the extremely ill-conceived “Jay Garrick and Keystone City was in stasis for decades” retcon, etc. The increasing time gap means the period of time the post-Crisis Earth went without any superheroes at all lengthened further and further. It’d become a good 50 years by the time the “New 52” reboot came along. (Granted, Marvel’s universe is similar, but their Golden Age seemed less of an influence versus DC’s on present-day stories, Captain America aside.) DC tried to fix this as well. Some stories revealed some Golden Agers sporadically came out of retirement during this half-century time gap. There was also the existence of a short-lived flower-power-era superhero team. On top of all this, a popular third generation of teenage characters soon came along. Tim Drake as the third Robin, Bart Allen as Impulse/Kid Flash, and so forth. Their popularity put even more pressure on the 12-year timeline. 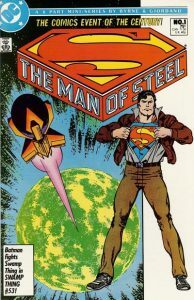 “Man of Steel” #1 (1986). Art by John Byrne. Finally, DC’s handling of rebooting stories/continuity doesn’t jibe with any other genre or medium’s handling of reboots. While reboots are popular (too popular) in Hollywood, they usually form a clean break from what came before. See the 2009 “Star Trek” movie’s reboot, or the James Bond revamp. Compare that to the confusing situation with DC. Readers are asked to pretend that various characters (despite the physical existence of years or decades of comics to the contrary) weren’t really in those stories after all but “really” featured somebody else in their role. Or that some stories still happened (somehow) but others didn’t. Or that only certain characters were rebooted (Superman and Wonder Woman) but others continued as if nothing had happened (Batman, Green Lantern, etc.). There’s also the notion that characters are easily “replaceable” in stories despite not being similar, and that it’s mostly women characters subject to such. Not to mention the increasing frequency of reboots and renumberings. And ultimately, all of the above is subject to editors’ whims, not to mention the company’s whims and marketing decisions. That about sums up the post-Crisis timeline. Some of the worst elements were eventually fixed or explained away. But at its worst, I’d wonder if even Stephen Hawking would have a hard time explaining things. Of course, there’s the irony that “Crisis” and its followup reboots/retcons were meant to make things less confusing. 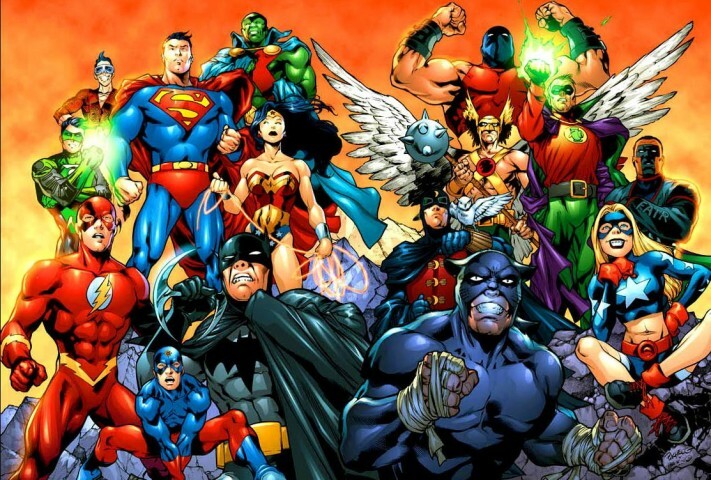 Either way, the post-Crisis DCU existed for 25 years, almost as long in real-world time as the period between the start of the Silver Age and “Crisis on Infinite Earths.” In 2011, DC decided to reboot their entire universe…well, almost all of it. The fourth and final part will look at the “New 52” timeline, which might be about as confusing (or even moreso) as the above.